After getting disastrously lost in South Melbourne (it’s one of my personal Bermuda Triangles in the dark) and downing a glass of Nogne O Norwegian ale, I had the good fortune to visit nearby Pekopeko (not to be confused with this Peko Peko) for the first time. I’ve heard eatie-foodie buddy Alex highly recommend their pop chicken (me: you mean, like popcorn chicken, from *text scratched out of transcript*? Alex: NO! well, I mean yes, but it’s called POP chicken. me: ah, okay…*scratches head*) but also took a fancy to the offer of an entrée special of wasabi mayo sliced beef and so, it was ordered. No regrets. 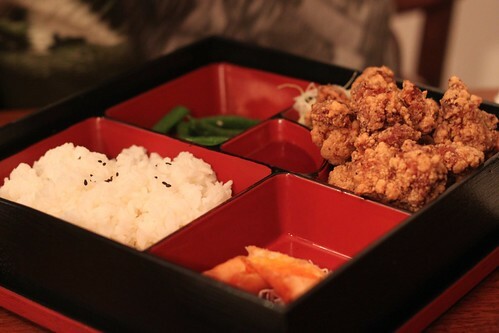 Ever faithful DSLR wanker and dining buddy Tris had been here before and said the bento boxes were imperative. I wasn’t going to argue. I chose the pop chicken bento after Alex’s testimonial. 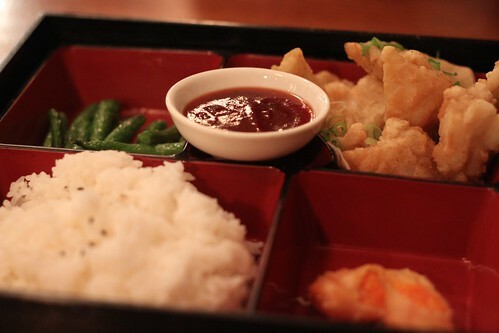 The bento boxes come with steamed rice sprinkled with black sesame seeds, pickled green beans and tempura something – not sure if it’s pumpkin or sweet potato as the texture of both is very similar when deep fried in batter. As for the pop chicken – tastebud explosion. Tender, wonderfully seasoned chicken morsels with the lightest, crispiest batter. These people could put You-Know-Who out of business. They remind me of kara age and tatsuta age but sort of rolled into one. 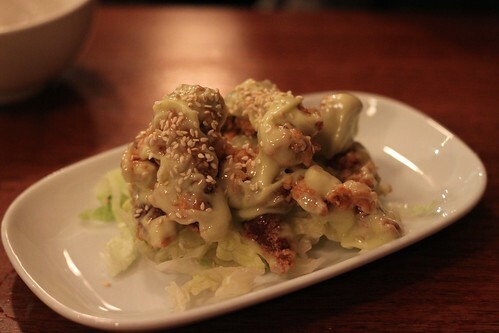 Indeed, Pekopeko is not strict Japanese fare but rather a fusion of Japanese and Taiwanese dishes and flavours. Give me more! Tristan kindly took me up on my suggestion of ordering the five-spice squid. I mean, come on, lightly battered squid then sprinkled with five spice? How awesome does that sound? (I resisted the urge to use an interrobang there but it was damned hard.) This too was scoffed down at maximum speed – unlike my pop chicken which was scoffed down at maximum velocity (running late for a silent film screening with live music accompaniment round the corner so I had to nick my chicken morsels for consumption on the run). Back to the squid – more subtle seasoning and the squid wasn’t super-fresh but still extremely tasty. Again, the batter was fantastic. I know I’ll have to visit again because I missed black sesame ice cream and Earl Grey pannacotta as dessert offerings. Oh to work in South Melbourne just so I could come here for lunchies (I’m told it is quite popular with the working locals). I will decimate you soon, my sweeties! With another bento beforehand, of course. The food is tasty and cheap and worth inventing excuses to head down for. This entry was posted in eatie-foodies dining out and tagged Asian fusion cuisine, Japanese food, Melbourne, pekopeko, South Melbourne on June 17, 2010 by gem.